I was passing through a lovely, small town and saw a stately but older United Methodist Church. I pulled over and tried to open the doors, they were locked. From across the street a nice woman, who I discovered was the lay leader of the congregation, came over and asked if I wanted to see inside. She escorted me inside to view the amazing stained glass windows and we discussed the health of the congregation. She let me know that they had about seventeen worshippers in church each Sunday and were “doing pretty well, surviving as best we can.” This phrase made me sad, since when is survival enough? One of the windows was the famous picture of Jesus standing outside of a door and knocking to come in. This window is a powerful statement of why surviving is not enough. It shows that Jesus is active in seeking out others, is working to connect with the disconnected, and is willing to do whatever it takes to serve those God has called us to serve, not just get them into the church. The picture of Jesus knocking on the door reminds us that Christ calls us to be active in seeking out our neighbors for intentional and meaningful relationship. It is our responsibility to be engaged with the people in our communities and go to them first, without expectation of them coming to us. Secondly, the picture reminds us that making the connection is our responsibility if we want to be like Christ. “Behold I stand at the door and knock.” It is not enough to open the church doors on Sunday morning and expect people to show up or to have merely passing relationships, we have to be out knocking on doors and discover where the needs are in our community. We have to invite people into our homes and our hearts long before we invite them to worship. We have to get out of our buildings and into the street to discover the places where God has uniquely placed us to make a connection. Get out there and get to know your neighbors. Lastly we have to do whatever it takes to be in relationship with those to whom God has called us to serve. While visiting the church the lay leader explained that the people in the community didn’t appreciate the way they worshiped. It seems to me that its time to change the worship style to reach the people to need Jesus. Mike Slaughter has often said that he knows a lot of people who would die for their children or grandchildren, but wouldn’t change their worship style to keep them from going to hell. Once a church ceases to exist for the purpose of reaching those outside the church, it ceases to be the church. Let us lay aside any weight that hinders us from reaching the people just outside of our doors. Its only a matter of time. 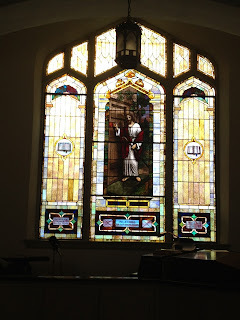 Seventeen faithful, senior souls continue to worship in that beautiful worship space and fellowship in the lovely community hall, but in a few years, with a few deaths, they will no longer be able to keep the lights on and pay the bills. Survival is not enough. Unless there is a radical shift in focus in this, and so many other congregations, the doors will be closed, the property sold, and the legacy of faithfulness abandoned. Let us leave the comfort of our pews and go out and knock on the doors, discover the needs, and serve those God has called us to serve right outside of our churches.